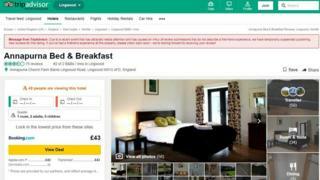 TripAdvisor has suspended reviews for the bed and breakfast used as the official address for the new Brexit Party after "malicious trolling". Annapurna Bed & Breakfast in Norfolk, run by leader Catherine Blaiklock's husband, was the address used when the party registered on 5 February. A party spokesman said the venue's rating had dropped in recent days. TripAdvisor said it halted reviews after "an influx of review submissions that did not meet our guidelines". The Brexit Party, which has been established to fight an election if Brexit is delayed, was officially recognised by the Electoral Commission earlier this month. Ms Blaiklock's home in Lingwood was used as the address when it was registered, and is also where her husband's business is based. Comments on the TripAdvisor entry for the bed and breakfast included "breakfast means breakfast" and "couldn't wait to vote leave", according to the Evening Standard. They have since been removed. A spokesman for the Brexit Party said he had contacted TripAdvisor about the comments, which he said had "damaged" the reputation of the business. He added: "It is malicious trolling, how else can you describe it? "It reminded Ms Blaiklock that there are malicious people with too much time on their hands." He said that the party was in the process of changing its official address. A TripAdvisor spokeswoman said: "The recent media attention on Annapurna Bed & Breakfast in Norfolk caused an influx of review submissions that did not meet our guidelines (our guidelines state that a review must describe a first-hand experience). "We took the decision to temporarily suspend publishing new reviews on its listing page, and posted a notice on the site to inform travellers of this."